Steve Worrall (right) in action for Newcastle Diamonds. 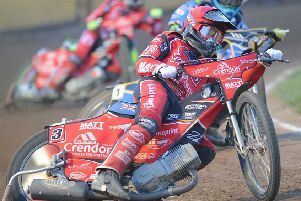 The latest addition to the Ben Fund Bonanza at Peterborough (March 18 ) is Scunthorpe’s new number one Stevie Worrall, returning to the club he rode for in the early days of his career. He has now progressed to being a valued member of the GB World Cup squad though of course nobody quite knows what is happening with that competition or any replacement this season. Steve is happy to be making his fourth appearance in the Bonanza. He said: “It means a lot to everyone in speedway, the majority of riders have had to use it once or twice in their careers so far and it’s nice to give a little bit back. It’s great what they do and should we ever need it, it’s there. “The Fund helped me when I broke my leg at Newcastle. I think that’s the only time I’ve used it but when I needed it, it was there. At that point we were really thankful for it, speedway riders don’t have any other income during the season. “You try to commit yourself 100 per cent to being a speedway rider, that’s the only way you can get the best results. “It’s a life-saver really, I don’t know what we’d do if it wasn’t there. There are still sponsorship opportunities available for this year’s Bonanza – riders, heats, fuel, tyres and meeting sponsorship. Contact Stephanie Babb on 07901 976912 for details or email admin@srbf.co.uk to get involved. Riders announced so far: Kenneth Bjerre, Hans Andersen, Bjarne Pedersen and Niels Kristian Iversen (Denmark), Chris Harris, Scott Nicholls, Ben Barker, Danny King and Steve Worrall (UK), Jason Doyle and Nick Morris (Australia).